GoodReads Summary: It's 1996, and Josh and Emma have been neighbors their whole lives. They've been best friends almost as long - at least, up until last November, when Josh did something that changed everything. Things have been weird between them ever since, but when Josh's family gets a free AOL CD in the mail,his mom makes him bring it over so that Emma can install it on her new computer. When they sign on, they're automatically logged onto their Facebook pages. But Facebook hasn't been invented yet. And they're looking at themselves fifteen years in the future. What I Think: I can't tell you how many flashbacks I had while reading this book. 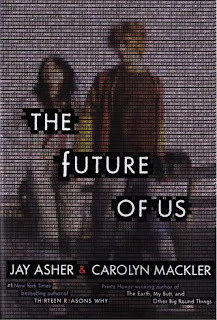 I was the same age in 1996 as Josh and Emma are in the book. I remember installing AOL, getting my first e-mail and a screen name, IMing and chat rooms. I can close my eyes and be in my dad's computer chair listening to the static fill the room before hearing the melodious, "You've Got Mail." It's kind of like this book is written for me...which makes me curious to hear how teens now relate to it. They are growing up in a world with so much more technology even though it has only been fifteen years. My youngest son can navigate our iPad on his own and get to where he wants to go and play the apps that he likes (which are mostly Thomas) and I've seen my oldest on my computer trying to touch the screen to make things work until I remind him he has to use the trackpad. The meaning of "mouse" that's not an animal is almost obsolete to them - which is crazy! If you know of a teen who reads this book or you are a teen reading this book, I would love to hear how they respond to it. It's either going to make me really sad or make me laugh at how much things have changed in huge way in the last 15 years. I think of it as mild science fiction but I think it technically really should be considered historical fiction, too. It's a look at the world fifteen years ago, and while fifteen years ago doesn't feel like it should be historical already, it's obvious how much has changed. Kids who read this will have to really imagine what life was like all those years ago - when the idea of having a mini-computer to carry around in your pocket was unimaginable. I love the idea of time travel. 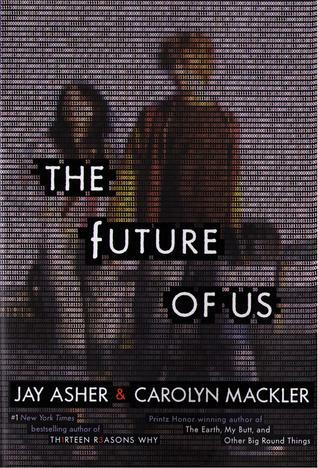 Even though Emma and Josh don't time travel, they can see into their futures and make changes to their lives. One of life's great enigmas is that we have no idea what the future holds in store for us. We can anticipate how our choices will change our lives to an extent but we can't truly see how making even one miniscule decision now might change our lives in the future. It's scary but exciting at the same time. What's truly awesome about The Future of Us is that Josh made a choice in his past that put a wrench into his relationship with Emma. He can't go back and change what he did but it's impacting their futures - and they can't "fix" their futures if they don't deal with their past - but they don't want to deal with their past. It's one big glorious paradox. It's apparent that I could go on and on talking about this book and that usually is a good sign that I loved it. Enough said. Writing Prompts: If you could guarantee one thing about your future, what would you want to happen or never happen? Write a letter to yourself to save and read fifteen years from now. Write about a childhood friendship.